... and it was so much fun! Yes, I said a trip to the hospital was fun! It's not any ordinary hospital and no, I wasn't sick or hurt or either was anyone I know. 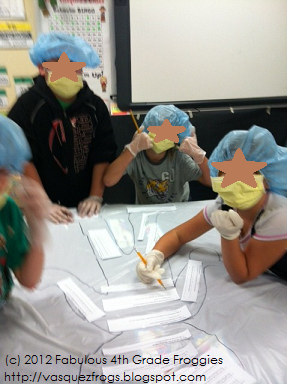 My fourth grade team and I became the head surgeons at Convention Hospital. Convention (as in writing conventions - spelling, punctuation, capitalization, etc.) 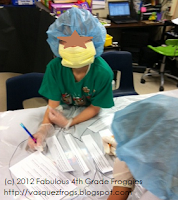 Hospital was such a hit with our students that it will definitely become a yearly tradition in 4th grade. Here's how our day went. At 10:10 AM it was time for the kiddos to go to Specials and it was time for "Operation Convention Hospital" for all 6 of the 4th grade teachers! As you may have noticed I'm not the fittest crayon in the box but you should have seen me move... I was as fast as Michael Johnson in the 1996 Olympics! I changed into my scrubs (that I bought at Walmart especially for this activity), put on my surgeon cap, medical mask, and my stethoscope. I looked in the mirror and wondered if I was in the right profession......the scrubs were soooooooo comfortable, I could get used to wearing them everyday and the money wouldn't be so bad either I looked dang good as a surgeon. LOL! Needless to say, the kids had the time of their lives! Every time the head surgeons saw each medical team work together nicely we would give them a colorful band-aid to place on their patient. Who would've thought a promise of a band-aid would make these medical teams work so awesome together. Here are some pics of the fun! 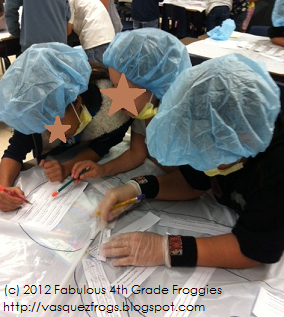 What are some fun but academic activities you do with your students? This looks like SOOOOOOOOO much fun!!! Way to get the kids engaged!!!! Thanks so much! It the first time we tried this and it was extremely fun! Sounds like a fun way to get ready for the test. This looks and sounds like SOO much fun! What a great idea! Thanks for sharing! Thanks Erika! Teachers and students both loved it! I LOVE it Lorraine! This is such a fantastic, engaging activity :) What types of things were your students working on in the stations? What a nice compliment Joyce! Thank you! 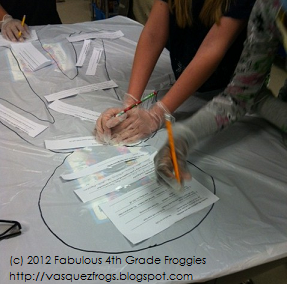 I hope you find a way to use this in your classroom......it was so fun! I agree with Joyce...this is a wonderful idea! How creative and motivating! I have been teaching 4th grade for 15 years...along with writing...and I have never seen this before. My hat goes off to you! Thank you for sharing. Definitely need to keep in mind. This would be a great activity to do during the week of our state testing. We test all morning and then try to do fun learning activities in the afternoon. Thank you for sharing! This is a fabulous idea! I am thinking that I could use this during our state testing week coming up. We test all morning, so in the afternoon we try to do fun learning activities. Thanks for sharing! What a cute idea!! I love it!! 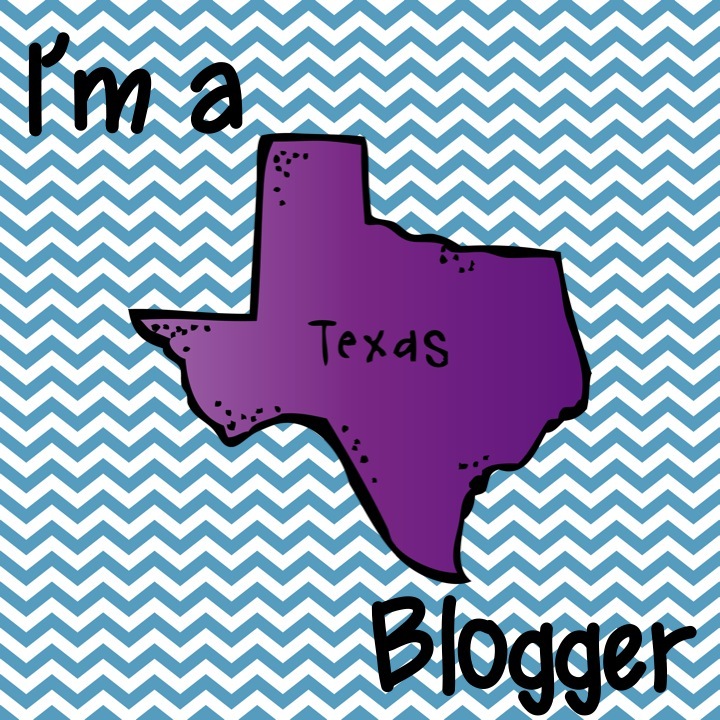 Your new blog look is sooo cute! I love it! What a cute & creative idea! We had STAAR boot camp on Monday. The teachers dressed up in camo (kids could too) & each teacher took a different aspect of composition writing to teach with a fun activity (narrative & expository intros & conclusions, differentiating between a narrative & expository prompt, elaboration, etc) & the kids rotated among the teachers every 30 minutes. Then in the afternoon we went outside for a STAAR pep rally where one of my colleagues had decorated a STAAR playground ball & each student got to take a turn kickin the STAAR as a way to get out anxiety & frustration & we ended the day giving each student a Starburst. They loved it. I can't wait to share your hospital idea with my co-workers! Lorraine, Lorraine, Lorraine! You have done it again!!! That is awesome! What a TOADally awesome way to test prep/review! I have shared it on my page! I would have loved to be there!!!! Thanks so much Rachel! We had so much fun! LOVE this idea!! I am so trying it!!! Awesome JLevine! Let me know how it turns out! Wow! I love this idea! I'm pinning it for later. Great job! You are so welcome! Hope it works for you! 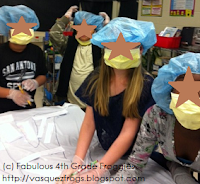 What a fun and exciting way of keeping students engaged!! Where did you get the hats and masks from? I've been looking everywhere and can't seem to find any. Thanks so much! 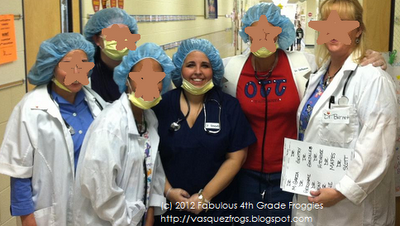 We had our nurse purchase the masks and hats and gloves for us but you can get the gloves and masks at most Walmarts. I would ask your local pharmacist to see if they know where to look. I just wanted to thank you for this idea!!! We did it today in preparation for our 3rd grade state testing. The kids LOVED it! We invited our Principal and Superintendent to swing on by and see the fun. When they did we gave them "Stat Cards" to read with new problems on them like: "Your patient is flat lining, quick highlight all the pronouns in blue." The visitors loved helping out and the kids loved the extra drama! We made areas like the "Comma Coma" in the brain where all they worked on were commas. The kids were always engaged!!! It was one of the best days of teaching this year. Thank you!!! What a wonderful compliment! Thank you! I love the "stat card" idea. We will definitely use that next year! That sounds like a blast! I would love to do that with my students. 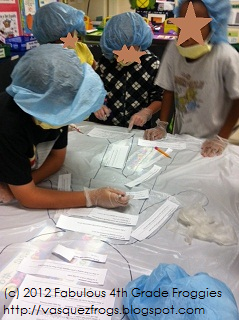 I am wondering what the students actually did to work together as a team and practice the conventions. How did the actual learning take place? Thanks for that tip!